Vanilla must be one of the most popular flavours and aromas ever. When cooking I always use vanilla extract rather than essence. Extract as the word suggests is extracted directly from the vanilla pod while essence is merely a whiff of vanilla in amongst chemicals. That explains the higher price of extract. A friend of mine, Vanessa Kimbell went to visit to a Ugandan vanilla farm earlier this year and in her blog post she explains just how valuable and special vanilla is. Making homemade vanilla extract may not be news to you but I seem to live under that rock that means you find all the best things out after everyone else! Rewind to this time last year, I saw this post and what a revelation it was to me! 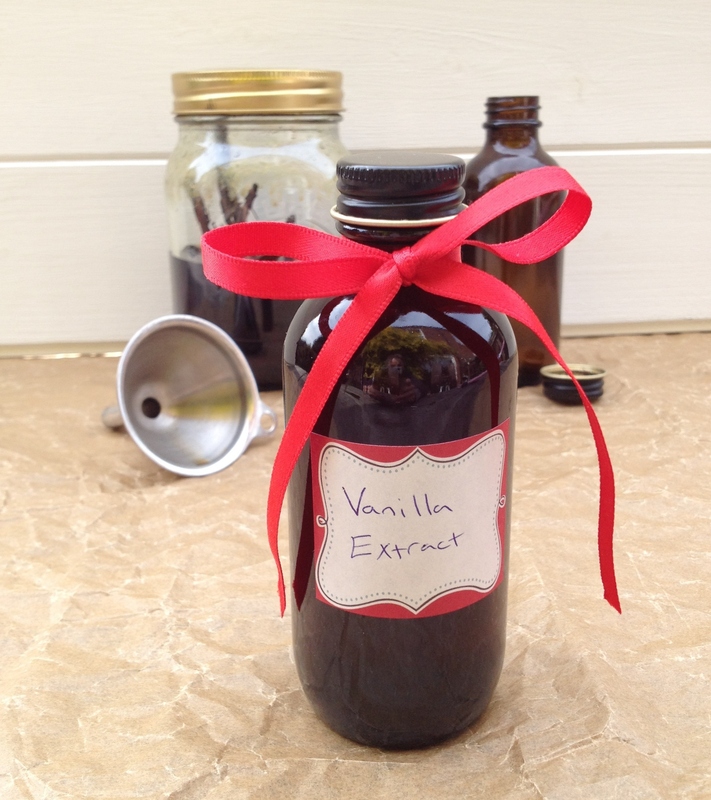 I had no idea you could make your own vanilla extract! 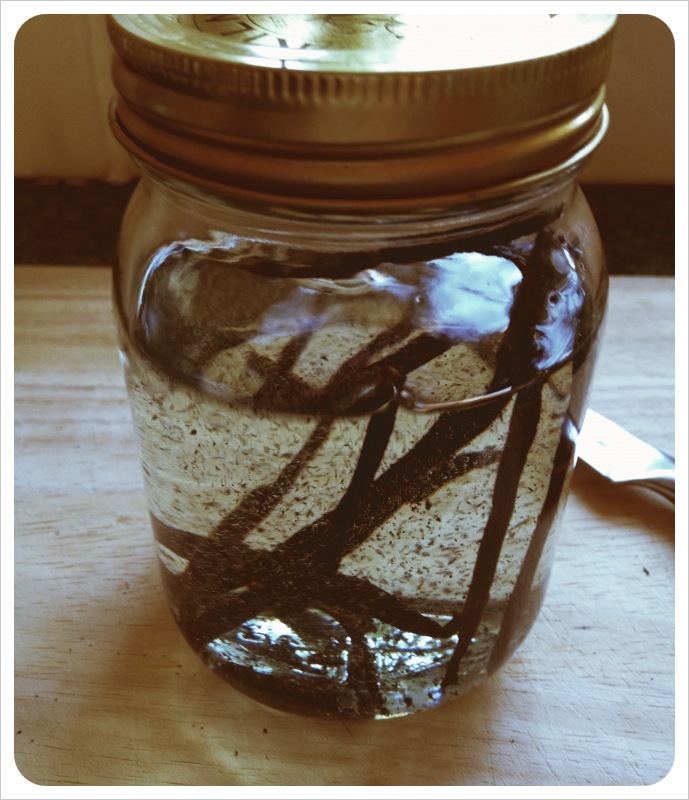 Of course since my eyes were opened to homemade vanilla extract I have come across other vanilla extract posts, confirming my living under a rock theory! Well better late than never I’ve since made my own vanilla extract and it’s really easy and very successful, it’s just like the store-bought vanilla extract! I’ve been using it all of this year, whenever vanilla is required in a recipe. There are many recipes for making your own vanilla extract, some say to heat the vodka, some make large quantities but buying so many vanilla pods is quite spendy and not knowing how happy I would be with the results I kept my quantities small, bearing in mind that the bottles of vanilla extract one buys are around 100 mls or less I still felt like I ended up with a good amount of vanilla. Of course it turned out to be wonderful so I could have made more! I’m posting this now in case anyone is inspired to make their own vanilla extract, if you start now it will be ready for Christmas and would make a fabulous gift for that foodie in your life! I’ve had trouble finding small bottles that are sold individually so for now I have saved the small bottles that store-bought vanilla comes in for refilling with my vanilla. I made my vanilla in a clean 500 ml size jar. Split your vanilla pods down the middle and place in your chosen jar. Pour the vodka in and swirl the beans around. Store in a cool, dark place for around 3 months, giving it a swirl every now and then. Thats it! So easy! When your vanilla starts running out just keep topping up with vodka and add a new vanilla bean. This entry was posted on October 7, 2012, 18:02 and is filed under Baking. You can follow any responses to this entry through RSS 2.0. You can leave a response, or trackback from your own site. Ditto – I am a vanilla “junkie” , preferring it to chocolate any day – great holiday gift idea, Jayne! Thanks ladies! Cant believe Ive mentioned Christmas already! Thank you! I know I would be happy to receive some! Thanks so much for your comment! I also love the inspiration from other blogs! Thanks for commenting, Im so glad not to be the only one who hadnt known about this! Nice post Jayne, I’ll have to try this out. I made some right at the beginning of the year, stuck it at the back of the cupboard and forgot about it until reading this post – must see how it’s getting on. As you say, it would make fabulous christmas presents – just need a few small bottles.